New recipes and cooking procedures developed in the 30-year-old company’s corporate kitchen are thoroughly documented by its training staff. “We work hard to ensure that what we are developing really works. Our training staff carefully documents each step in the process with video and photography, and then we thoroughly test the procedures in our restaurants to make sure they work,” he says. “We take great pride and care in our training and are very structured and thorough in our operations, and that is what differentiates us from other companies. “We focus on how to properly execute and partner with our training team and operations team to ensure new items are introduced properly,” Groll says. Pollo Tropical is celebrating its 30th anniversary this year. Brothers Larry and Stuart Harris opened the first location in Miami in 1988. Today, the company owns and operates more than 140 locations in Florida and the greater metropolitan area of Atlanta, Georgia. In addition, the company oversees five licensed restaurants on college campuses and franchise locations in the Caribbean, Central America, South America and Puerto Rico. The Pollo Tropical brand is owned, operated and franchised by Fiesta Restaurant Group, which also owns the Taco Cabana fast casual brand. 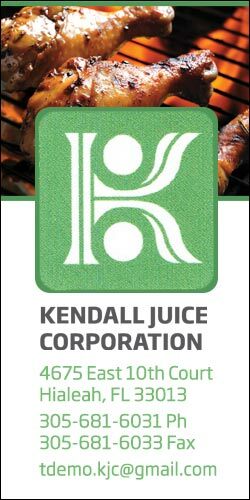 Although the company has grown significantly from its origins, its commitment to preparing fresh, great-tasting, citrus marinated chicken and other menu items remains its common thread. Most of Pollo Tropical’s menu items are prepared in each restaurant. Fresh, never frozen chicken is vacuum-tumbled in a citrus marinade that includes seasonings, herbs and fruit juices for 24 hours. This marination method allows for maximum absorption of flavors within the chicken. All of the chickens prepared by Pollo Tropical in its restaurants are fresh, never frozen. The company’s chicken vendors ensure the birds are of a uniform size. In January, the company announced that all of its locations would serve only chicken from producers that are certified as No Antibiotics Ever (NAE) compliant by the United States Department of Agriculture. “It’s very important to us that our poultry is never exposed to antibiotics, and it is part of our continued commitment to quality, fresh, wholesome ingredients,” Groll says. All Pollo Tropical restaurants include open kitchens, giving them further visibility and accountability to guests. “Our guests see us preparing their food right in front of them,” he adds. In addition to its core offering of half- and quarter-chicken platters, Pollo Tropical’s menu also includes roasted pork and BBQ ribs. The restaurants also serve sandwiches, wraps and its “Create Your Own TropiChops” bowls. The company also prepares dressings and an array of signature salsas and sauces. These items are prepared in small batches throughout the day and held for a short period of time. “It’s important to us that our guests get a product that’s as fresh as possible,” he adds. Pollo Tropical continues to find new ways to evolve its menu as well as the ways it serves its guests. In December 2016, the company introduced Pollo Tropical Express, a drive-thru and walk-up only concept that features two drive-thru windows and a walk-up counter. The concept thus far has three locations in parts of Miami where the company is seeing high customer volumes. “It’s a concept we have seen great success with, and it’s one we are continuing to explore,” Groll notes. Earlier this year, the company introduced Pollo Bites, its first foray into crispy chicken and an entirely new way for guests to enjoy the restaurant’s Caribbean-inspired, 24-hour citrus marinated chicken. Pollo Bites are prepared fresh daily with hand-cut chicken breast pieces that are marinated for 24 hours in the restaurant’s signature blend of citrus juices and spices before they are breaded in flour. They are available in orders of five or eight pieces as well as in wraps and bowls. “[Pollo Bites] have really captured our guests’ interest and the response so far has been extremely positive,” he adds. Pollo Tropical plans to follow up Pollo Bites with further crispy chicken menu items that will carry on the fresh and flavorful legacy Pollo Tropical has established through its special blend of citrus juices and spices. “We are always trying to find ways to add more dishes to enhance our menu, and raise the bar on what makes great chicken,” he adds.